I was here little earlier so I caught a bit of the final part of the discussion. I thought that was quite good. I totally agree that it has very little to do with what you studied in college. Take me as an example. I was trained as an architect and I guess I failed in my profession. I only worked for a very short while (as an architect) doing bathroom details which really bored me and I changed profession to something else. So it doesn’t matter what it is and really most important of all, personality. Show your personality. I mean don't hide it. I think Asians, particularly people who were raised in Hong Kong. You tend to hide your personality. You don't let it shine. I mean you all have big personalities. So nurture that and try to grow that and show people what you have. I think that is a very important asset that you have. So value it a lot. 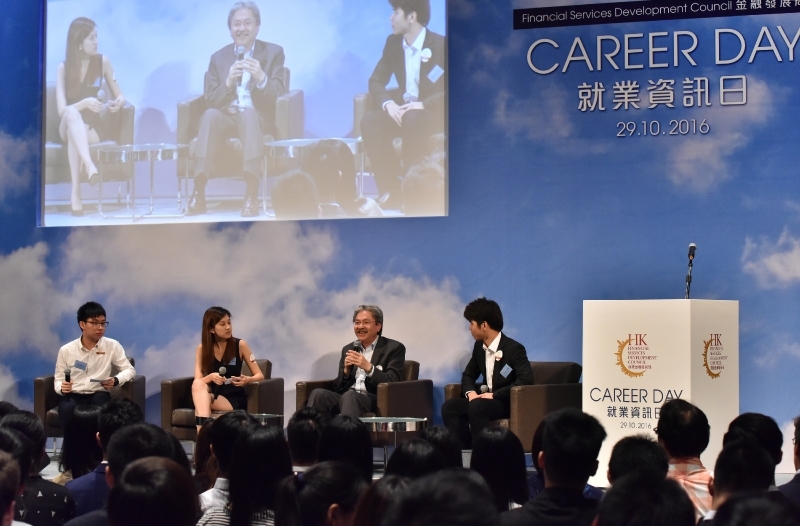 Indeed it is my great pleasure to join you all today for the third annual Career Day of the Financial Services Development Council. I am particularly glad to see the many young and hopeful faces in front of me. You remind me of my own youth actually. And I am sure that my dreams, back then many decades ago, were not all that different from those that you so passionately hold to today. You are here, of course, looking for the first-hand information and looking for professional insights for embarking on an exciting and successful career in financial services. I am sure that the group of impressive speakers that I saw in the programme have been able to provide you with all the inspiration that you need on that score. And in closing today's event, let me share with you the bigger picture, about why your future lies in Hong Kong's financial services sector. 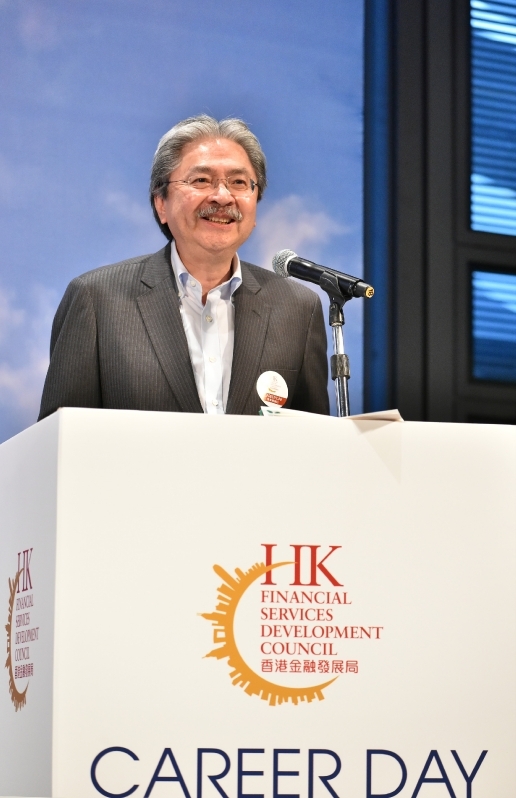 To start off with, while our financial services sector employs only about 6 per cent of Hong Kong's working population, it contributes some 16 per cent of our total GDP. The point here is clear and compelling: the financial services is a high value-added profession that is crucial to the sustained prosperity of Hong Kong's economy. Hong Kong is a leading international financial centre. And equally important, we are the international financial capital of China. While China's economy is growing somewhat slower than before, it is still the major driving force of the global economy that's contributing about one quarter to one third of the world's economic growth. Hong Kong has long been our nation's critical intermediary, channelling foreign investment and capital to fuel the Mainland's extraordinary growth. Our financial services sector, in particular, has been playing a major role in the internationalisation of the Renminbi. We are the world's leading offshore Renminbi business hub, with the largest offshore Renminbi liquidity pool at some 730 billion Yuan at the end of August. In the first half of this year, some 70 per cent of the world’s Renminbi payment transactions were processed right here in Hong Kong. And where you are sitting in HSBC, they processed a pretty big part of that. Following the IMF (International Monetary Fund)'s decision to add the Renminbi to its SDR basket starting from the beginning of this month, banks and financial institutions in Hong Kong will benefit from the growing demand for Renminbi trade settlement and investment services. Our deepening economic ties with the Mainland, in the form of the Shanghai-Hong Kong Stock Connect, the Mainland-Hong Kong mutual recognition of funds arrangement, as well as the Shenzhen-Hong Kong Stock Connect which will be launched soon, will help accelerate the opening up of China's capital markets to the world. These initiatives will also create more opportunities for our financial services sector. I wish you all every success in your future career and your future endeavours. Thank you very much and have a good day.